This was a strangely and perhaps mercifully thin year for Superhero RPGs. Only a single completely new game released in printed form. Even that reused an earlier system. Some lines got support but generally they remained static. Compare that to 2014 where we saw a dozen new supers rpgs (Cold Steel Wardens, Valiant Comics RPG, Worlds in Peril, and many more). 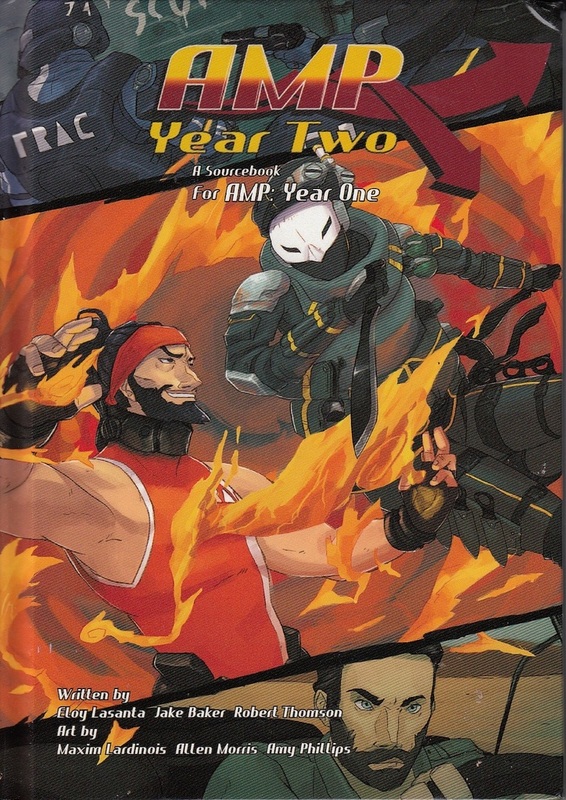 It also marked another year where we didn’t have licensed super RPGs from the big two in active circulation. Marvel Heroic vanished at the end of 2013 and DC Adventures continued to be sold at a deep discount during the Green Ronin Holiday sale. But it was a decent year for supers in other media. In board games we had continued support for Hero Clix, Marvel & DC Dice Masters, Marvel Legendary, Sentinels of the Multiverse, and the DC Deckbuilding Game. We also saw a few new products- Heroes Wanted, Sentinel Tactics, the V&V Card Game, and SuperPower SmackDown!—none of which made a real splash. In video games we got Batman: Arkham Knight and Lego Batman 3 Beyond Gotham. On TV we saw Powers, Daredevil, Guardians of the Galaxy, Supergirl, and Jessica Jones. In film Avengers: Age of Ultron, Ant Man, and Fantastic Four. So a respectable year, if not flashy. Surprisingly television's the real stand out among those. I begin with core books here. I include Kickstarter projects if they actually released in 2015. I give pdf-only releases their own entry if they’re notable, of significant size, or come from a major publisher. I’ve consolidated a ton of material into several ”Miscellaneous” items at the end. I’m sure I missed some releases. If you spot them, leave me a note in the comments. AMP remains one of the most interesting superhero projects out there. It began with AMP: Year One, detailing the recent appearance of amplified humans. This volume moves the story forward while adding new powers, concepts, and foes. I interviewed designer Eloy Lasanta about his work. You can see that here. Striking ly, AMP takes a "meta-plot" approach. That dropped of fashion in rpgs after the end of old World of Darkness. Lasanta handles this line smartly, keeping it limited to one product line. He’s also shown his mastery of Kickstarter projects in both delivery and conception. His backers get to see where the setting goes and absorb new ideas for their own campaigns. He’s been good about interacting with his community and taking feedback. Besides AMPP: Year Two, Third Eye Games released several support products for the AMP line. Most important might be the various affiliation guides, describing major groups in the setting (The Changelings Affiliation Guide, TRAC Affiliation Guide). They also bundled together several pdf scenarios into one collection, AMP Adventures. We've seen supers dystopian approaches in comics (The New Statesmen, Marshall Law), events (Age of Apocalypse, World's End) and RPGs (Underground, Brave New World). Extreme Earth returns to that territory, taking old elements and stretching them further than we've seen. Government control and public backlash usually exists as a hanging threat, a front to be be fought against (consider AMP and Aberrant). This setting makes that front and center. Those controls have already arrived. This is a world like ours but in much worse shape. It had fewer natural resources than our own. Shortages combined with disastrous climate change has created chaos. Corporations and private military organizations have seized greater influence. All of that’s made more dangerous by Super Talents, a force every faction wants to control. These arose out of post WW2 experiments. There's echo of Garth Ennis' The Boys in tone and set up. Extreme Earth combines an Iron Age sensibility, a grounding in realism, and anti-hero revolutionaries. The first 30+ page chapter sets up the timeline, technology, and current situation. Chapter two introduces FIST, the Department of Federal Investigations into Super Talents. Imagine a nastier SHIELD with a public version of the Suicide Squad at its disposal. Chapter three looks at who you might actually interact and what you might actually do in the setting. It has some interesting ideas and follows that up with a sample adventure. That assumes a PC group acting as black ops agents for FIST or another organization. Extreme Earth had a successful Kickstarter; I backed the project. The designers created multiple versions of the setting. That offers one for each of most the major superhero systems: M&M, Fate Accelerated, Supers!, ICONS, Bulletproof Blues, Savage Worlds, BASH, Cold Steel Wardens, and HERO. Supers games have really embraced cross-system development in recent years. That’s awesome. I’ve looked over the M&M material and it holds together. That being said, Extreme Earth is not my bag. I skipped out 1990's comics. My vision of "Iron Age" is more confined to Batman: Year One, The Dark Knight, and other late '80's approaches. There vigilantes struggle with moral issues, tragedies, and responsibilities. That's part of why Cold Steel Wardens appealed to me. 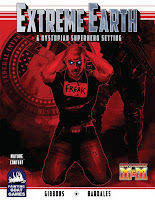 Extreme Earth is dark, nasty, nihilistic, violent, and strapped with weapons. That's not what I enjoy. As well the setting's pretty deeply written; that makes it tough to lift material for other games. It's also weirdly unbalanced in presentation. For example, EE spends a lot of time detailing the personalities and background of super NPCs. There's six pages on a single superteam member, Nightshade. Many others get similar treatments. That feels like overkill. It's missed opportunity; piling things on rather than offering more material and ideas. 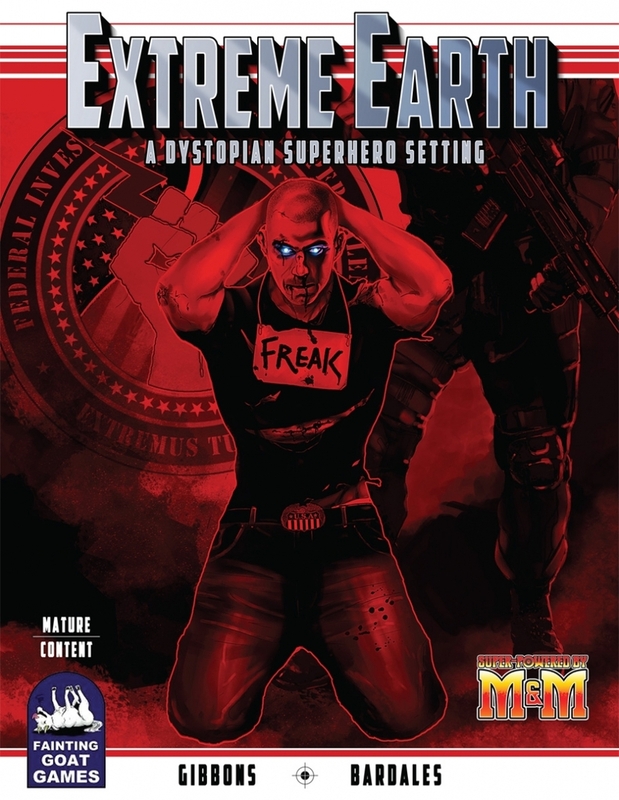 On the other hand if you're looking for a generally well-written and excellently illustrated dystopian supers setting, Extreme Earth could fit the bill. It's certainly more adaptable than other parallel products. Who knows, I may swing back to this if I need a quick alternate world for a supers campaign. 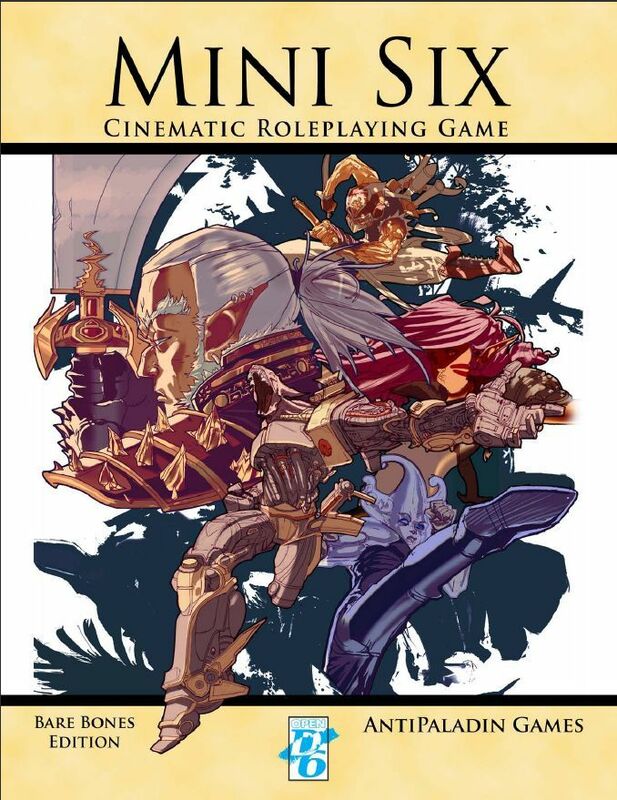 A French supers RPG aimed at younger players, specifically 6 to 12 years old. 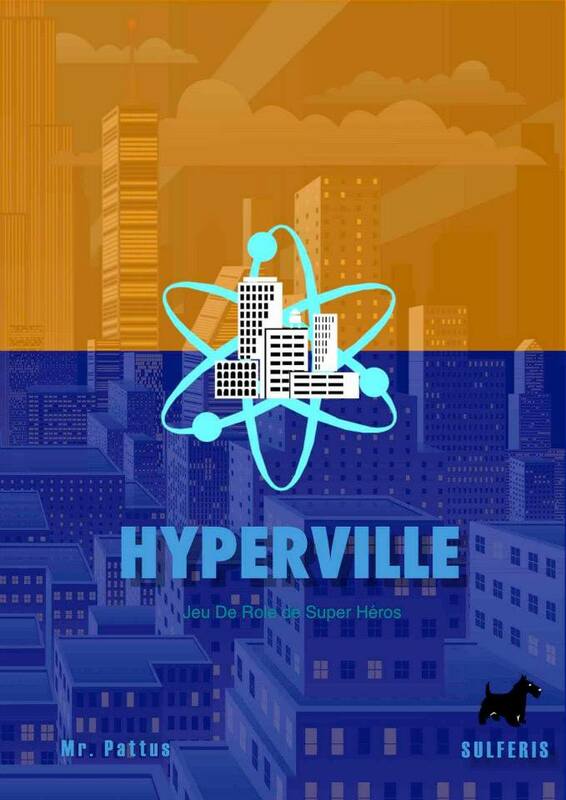 The characters are supers defending the titular city of Hyperville. Resolution uses just a d6. The descriptions I read make it seem like it actually has a lot of details. Translated from le Grog, "A hero is defined by six qualities: strength, mind, energy, speed, intellect / instinct and aura (values ranging from -2 to 4), characteristics that are calculated from qualities (number of actions per turn, Speed of movement, reflexes, invention, deduction, super, popularity, lifting, leap, physical, energetic and mental fighting capacities, with the corresponding resistances. These heroes have powers, divided into three categories: energetic, and strange." But it’s also describe as narratively focused, so I’m not certain. Regardless I'm glad to see something like this. We have many fantasy games aimed at children, but fewer super ones. That’s a missed opportunity. Given the popularity of superhero films and more importantly younger-skewed superhero animated series, game companies are leaving money on the table. Green Ronin's had just a single major release for M&M: the Cosmic Handbook. Not collected from earlier pdf releases, this offers new game material. It operates like their other genre books. The Cosmic Handbook has the twin task of doing both space supers (Green Lantern Corps, Guardians of the Galaxy) and future heroes (Marvel 2099, Legion of Superheroes). The first chapter lays out and goes over the genre conventions. That's most useful for someone coming in cold or GMs without a clear sense of what their campaign. Chapter two looks at common powers and offers some builds. It also has useful PC templates. Chapter three's focused on the GM, with advice on what players actually "do" in a cosmic series. It also has example villains, minions, and pets. Chapter four and five lay out expansions of the house "Freedom City" setting. The first covers space in the contemporary era and the second covers the setting in the year 2525. The company also continued their pdf series, each intended for a future collected edition. Rogues Gallery offers adversaries; that has not yet been released in a single book. On the other hand the second series, the Atlas of Earth Prime, got bundled in 2016. That has brief pieces on just about everywhere in the Freedom City universe. Subtitle: “Victorian Role Playing Adventure in the Age of Supermankind.” This is, I believe, the third Victorian supers game I’ve seen (after Agents of the Crown and The Kerberos Club). Victorious comes from Troll Lord Games and uses the SIEGE Engine. That modified d20 system also powers Amazing Adventures, Castles & Crusades, and StarSIEGE. 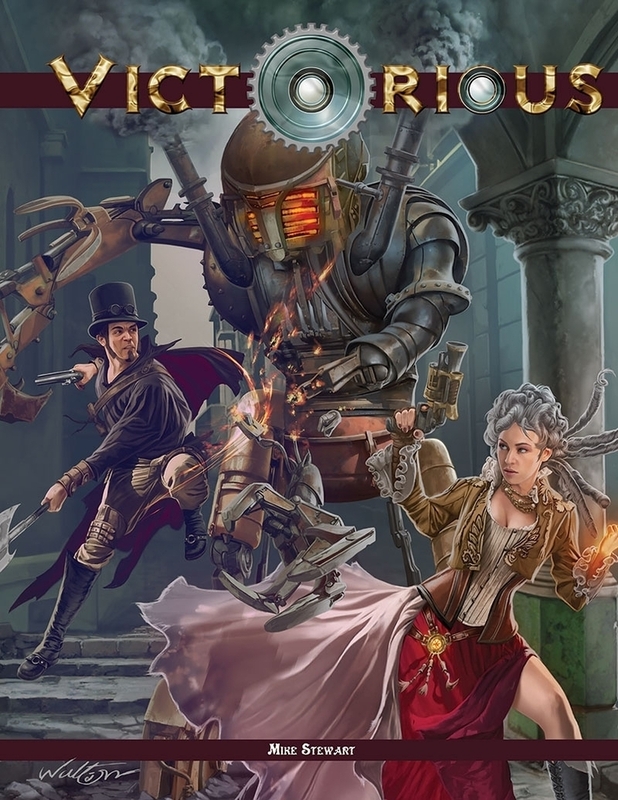 Victorious infuses a classic Victorian setting with literary characters (Sherlock Holmes, Captain Nemo) and vigilantes using "phastasmagoria" to battle injustice. It leans into the early LXG. This is a relatively slim core book, with a system d20 aficionados may find easy and light. It includes seven base classes: Contrapionist, Hypnotist, Inquiry Agent, Paragon, Radiant, Strongman, and Vigilante. Character creation’s dispensed with in a little over twenty pages. The actual resolution mechanics (attacks, saves, experience, etc) is dealt with even more quickly. Most of the rest of the book, just under 100 pages, treats the setting. That has notes on travel, organizations, the Victorian era, and Bestiary. The last chapter-- "The Supermankind"-- covers a host of topics including GM advice. Incidentally, the GM is the Genteel Magistrate making it the 145th unique name I’ve found for this role. "Super-powers" as such come to characters as they increase levels in their class. That's a bolt on to the SIEGE mechanics. 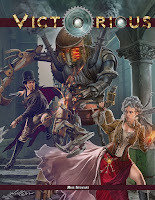 In other words, Victorious is very much a Steampunk game first and a supers game second. The publishers have supported the line-- with many supplements coming out of a highly successful Kickstarter. If you're interested I recommend checking out sharp-minded Timothy Brannan’s The Other Side Blog, which has a solid look at it. As of the writing, Victorious has a relatively high price point ($21 for a 144 page pdf) that's kept me from picking up a copy. Comic Book Adventures is an adaptation of Heroes Wear Masks, which in turn is adapted from Pathfinder. Here's the game’s pitch, "Want to play a super hero RPG, but have no one around to game with, well Avalon is here to save you from your boredom. Yep its here at lasts, a solo system for playing a comic book super hero RPG." CBA handles this in two ways. 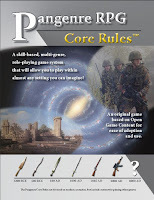 The core rules include a modest random generator (The Patrol Chart) and Avalon Games has released several solo modules. These present a series of incidents rather than CYOA menu. 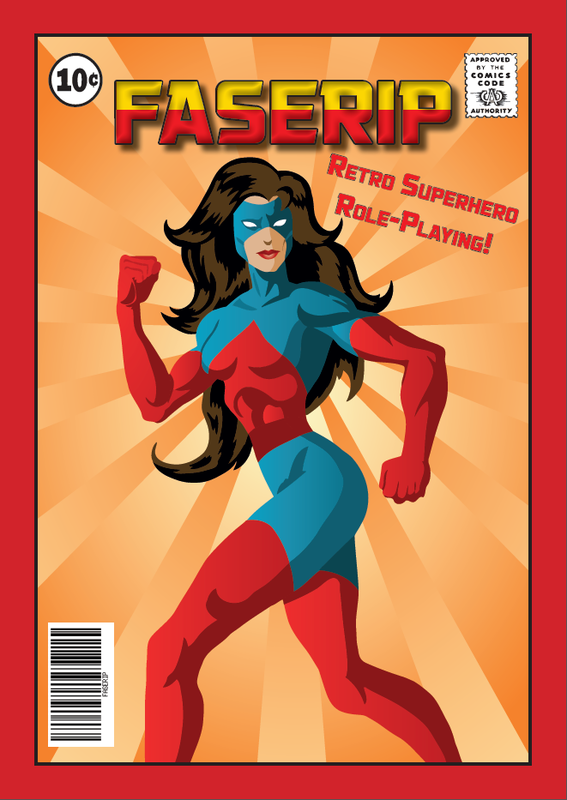 FASERIP wears it's origin on its front cover. The many other TSR Marvel clones have been more coy. Still this is the cleanest of those retro-clones. It has crisp layout, smart organization, and a decent choice of stock art. FASERIP even has a complete index. I have only one quibble. It uses a weird colored and shadowed font for some terms in the text. That’s hard to read and a weak design choice affecting usability. Sentinels of Echo City calls itself a love letter to '84, it "answers the question, "what if the designers of FASERIP used the B/X system instead?"." So if you were wondering that, here you go. The designer has released several supplements, including Absolute Power which adds new character options. If you want an OSR approach to supers, this has it for you. One warning: the art's a little weak. Black Operators: This offers a revamp for the Psi-Watch setting. That's a d20 Modern adaptation presenting a world of hidden mentalists combining espionage and supers. I missed it on earlier lists. That's a cool concept and another one we haven't seen used much. ICONS A to Z: A pdf series covering various topics in the ICONS universe (i.e. Aliens, Battles, Demons). The Enlightened Man: A Renaissance supers setting for use with Spark! and Fate Core. That's a great concept and one I haven't seen before on these lists. Strangers: Les Empires Galactiques: A supplement for the French supers rpg Hexagon. This details the greater galaxy, ala The Cosmic Handbook mentioned above. Superstring Multiverse Worldbooks 1 & 2: Expansions for the Superstring campaign framework. These offer new dimensions to explore in the multiverse. Volume one has a world of supergods and one of chaotic energies. Volume two has both a ‘Golden Age’ setting and a grim & gritty world for contrast. Thrilling Powers: A collection of powers and concepts for Worlds in Peril. Super useful for GMs and players. Worlds in Peril has an open approach to powers which can be daunting. This offers a better sense of the boundaries. Necessary Evil 2:Breakout: Returns to the “Villains Resist an Alien Invasion” world of Necessary Evil. This is actually a prequel. In it, lower-level villains and other superbeings attempt to survive in the new created prison that is New York. It stands on its own and has a complete campaign, with the players trying to form gangs and build a resistance. 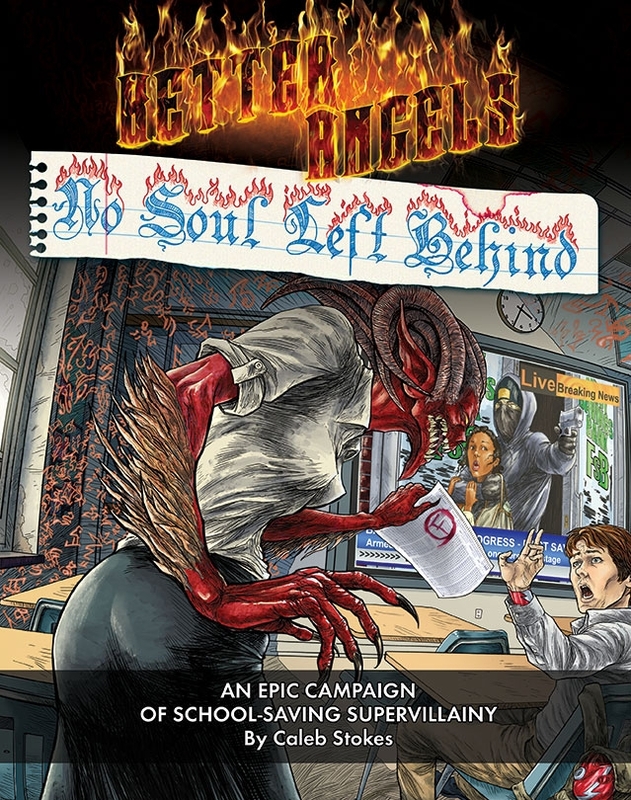 No Soul Left Behind is an amazing supers campaign for Better Angels. In that rpg you play villains trying to contain their own demonic nature. NSLB is a teen campaign set in an experimental charter academy. It's a brilliant set up for those who like tightly plotted adventures. 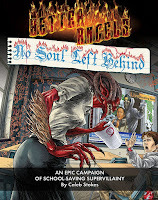 More than anything, No Soul Left Behind presents a great starting point for new Better Angels campaigns. That same strength makes it less useful for other kinds of campaigns. I backed it hoping I might be able to borrow ideas. There's great stuff here but it would need a lot of reworking. 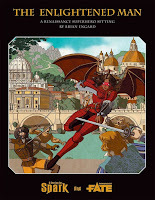 Next provides a campaign and toolkit for the Italian rpg #urbanheroes. 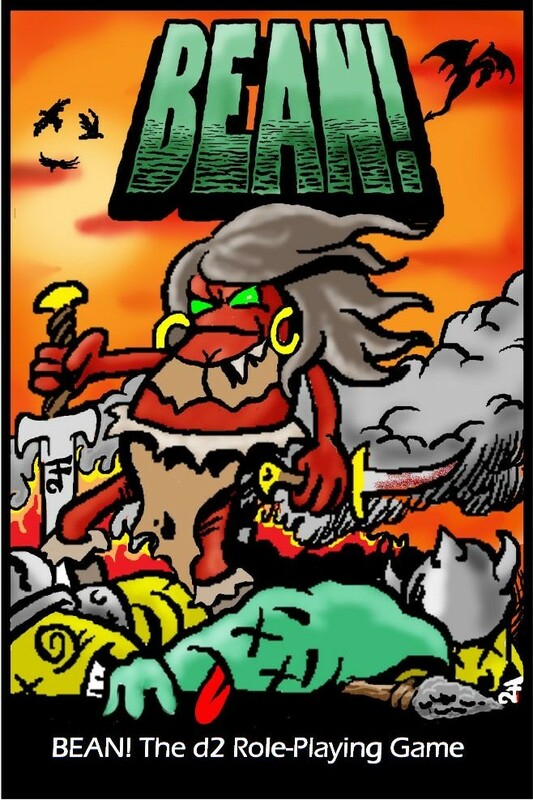 That's a dark, Iron Age-esque rpg with some satirical content. The translated blurb reads, "If you liked this Marshall Law, America's Got Powers, Top Ten and if you think it to be a HERO you don’t just fight crime in the streets, NEXT is the adventure for you!" Looks like it has setting material for NYC, a host of NPCs, as well as a multi-part linked adventure. 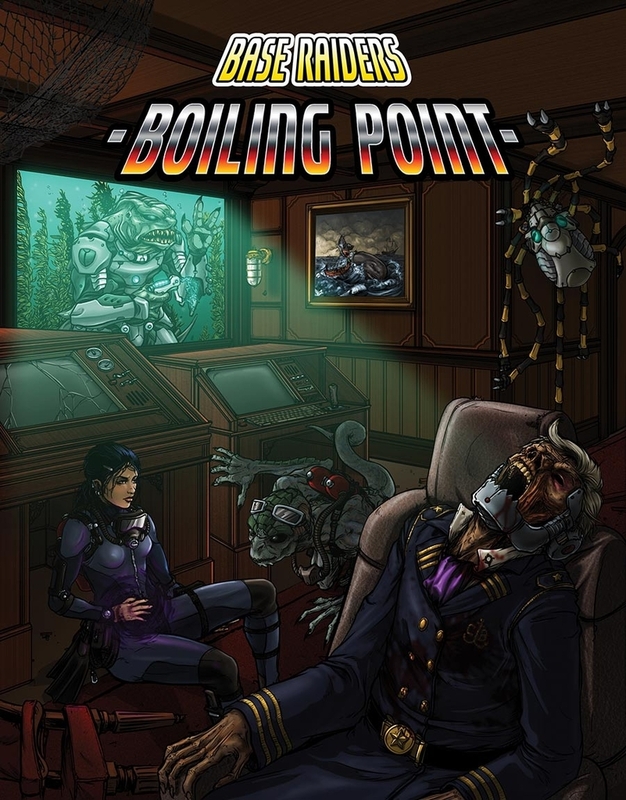 Boiling Point is a lengthy scenario for Base Raiders. BR remains one of my favorite supers concepts and I backed the BP Kickstarter. 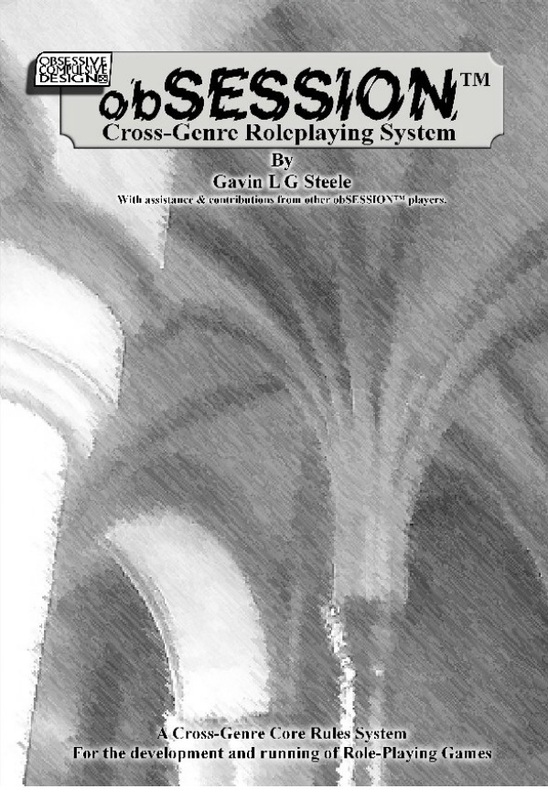 The designer has released adaptation notes for several systems, including M&M. It does a great job of showcasing what a "base delve" looks like. This adventure splits into investigation and discovery, followed by breaking into the facility itself, located underwater. I love that detail and it elevates the whole thing. Improbable Tales released several adventures more in this series, including Belly of the Beast and Eaters of Steel. 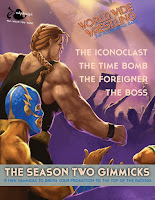 These have three distinct versions: ICONS, SUPRS!, and Savage Worlds. Ad Infitium dropped more adventures for ICONS: Urban Jungle and Devil's Night. As well, Blessed machine released Evilution Unchained for the system. Several SUPERS! modules arrived: Havoc on Halloween, Scene Stealers 2: Bad Moon Rising, and The Heist. Centerville: City Under Siege came out for Villains & Vigilantes. That has players dealing with a whole city held hostage. Both Comic Book Adventures & Sentinels of Echo City mentioned above released adventures and NPC/scenario hook supplements. Finally To Stand Together is an intro adventure for the BASH system. Algernon Files: Blackwyrm had been releasing additions to this M&M 3e series and collecting them in larger volumes. That project seems to have stalled with the last, Carapace, appearing in 2015. Capes, Cowls and Villains Foul: Quick Bio – Cliffhanger: Dedicated to the late, great artist Herb Trimble. This takes the character he illustrated from the earlier Omlevex supplement and presents it with Capes, Cowls, and Villains Foul stats. The Super Villain Handbook: Not a series, but a large collection. Released in 2015 for Fate Core and SUPERS!, the following year would see a “Deluxe” edition for ICONS. Please note the newb in the title is not you, it’s me. I only started watching and reading about Pro-Wrestling last year after encountering the World Wide Wrestling rpg. There are many smarter people than I, especially about wrestling. But I thought I’d put together a list of things I had no idea about before I started watching. If you’re a new player to WWW this might help. It’s a supplement to the excellent guides in the core and WWW: International Incident books. I’m repeating some of that to reinforce concepts. You’ve got a few ways you can lose in a Wrestling match. The obvious one’s having your shoulders pinned to the mat for a three count by the referee. If the fix is in, the ref might do a “fast count.” When someone breaks a pin, they’re “Out at two” or “Out at two & a half.” You usually see close pins in matches with False Finishes. That’s when you’re a hairsbreadth away from losing and somehow recover. That’s a cool way to describe a high point of the match. Some matches have several false finishes, building the energy. You can also lose via Submission. Essentially your opponent gets you in a painful hold and applies pressure. There are neck holds- but you can’t really do a strangulation choke hold (unless you’re heel). The ref’s supposed to watch for chokes and break those up. To get out of a submission hold, you can reverse it, putting your opponent in a hold. You can also just break free physically (overcoming with strength, open fist strikes, etc). More flashy is Putting Your Leg on the Bottom Rope. If you’re held and you put your leg on the rope, the ref’s supposed to break it up. So you’ll see wrestlers in holds desperately trying to pull themselves to the edge to get their leg there. You’ll also see opponents thwart that by dragging them to the center of the ring. They talk about Ring Awareness to describe a wrestler knowing where the ropes are relative to their downed body. Alternately, a wrestler might be so badly beaten, they’ve lost any sense of direction. You can also lose by Disqualification. You use a weapon or a “foreign object” in a match which doesn’t have a stipulation allowing that. It can be flash paper, sand in the eye, glitter spray, or anything that sells your shtick. Sometimes wrestlers don’t care that they’re going to get DQ’d, they just want to beat someone with a chair. You can describe this after you’ve lost a match to work the crowd or another move. Chairs get used in lots of ways- not just smacking people with them. Sometimes they’re used as a pinning object to hurt a limb. Sometimes they’re a board a wrestler jumps against to make an impact look cooler. Disqualification can also come from third party interferences (like friends at ringside grabbing your opponent). Don’t forget about referees. They’re great engines for Heel/Face move explanations. Hitting a ref can result in a DQ. Referees can be great NPW characters. Maybe a ref has a beef with someone IRL. A classic bit is to have a stipulation where another wrestler has to be the “guest ref.” Of course the most important part of a referee’s job is to be distracted by someone or something so that one of the wrestlers can pull off hijinks (or shenanigans, your choice). When a wrestler Sells something, it means they’re making their opponent’s blows or attacks look like they hurt. If someone works your arm hard, you want to sell it being weakened and in pain for the rest of the match. Selling extends to leaving the ring, staggering from the brutality of the match. To No Sell means to take the hit and make it look like nothing happened. It’s used as a way of demonstrating someone’s fearsome strength or resilience. Crappy wrestlers no sell because they’re not skilled. As mentioned in the book, a Shoot is when something happens legitimately. Usually it’s about someone going off-script. So a “shoot” interview is one where a wrestler talks about the problems behind the scenes. That’s part of Breaking Kayfabe. A Work is any set up or scripted interaction, hence the stat name. You’ll commonly see arguments among fans about whether something was a shoot or a work. Like one wrestler chewing out another one to their face. “It looks too real; it looks too fake.” That gives fans something to argue about. Good bits make it hard to figure out. 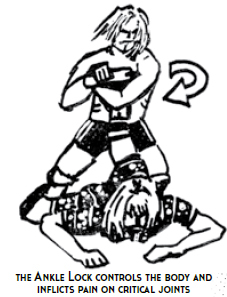 Several of the moves allow you to add a Stipulation to a match. The book has a little bit about that, (p. 70) and there’s a little more on the reference sheets. Stipulations allow you to change the character of a match. That can be window dressing: making someone look good, putting them at an apparent disadvantage they have to overcome. You can also use this as an opportunity to push your way up the card. Stipulate for the match allowing you a shot at the champ or belt in the future (alternately use a controlled booking for this). Bottom line, think creatively about your stipulations. Many moves also allow you to book a match. That match can happen that session or you can put it off for the next time. It’s a good way to bring in rivalries with NPW’s or a get a shot at starting heat with a belt holder. Be flexible about your booking. If you just want to show off, you might ask for the Creative to feed some jobbers to you. You could use that to Cut a Promo or Work the Audience without playing out the whole match. When you Cut a Promo, you present something-- a speech, an interview, or a pre-recorded package-- where you bring up an opponent. You name them directly or indirectly. As it says in WWW, you want to build up your rival a little before talking trash about them. It makes things sound more real. When you Work the Audience, there’s no specific target of your ire. You’re whooping things up as you come down the ramp, you’re engaging in patriotic rhetoric, you’re doing a dance number, you’re bitching about treatment. It’s obvious, but it took me a couple of sessions to figure out what triggered when. One of the things we haven’t seen as much in our matches are Run Ins. In WWW move terms, that’s someone coming in to interfere with a match. The core book gives a nice example of a non-planned Run-In (p. 27). Runs ins don’t necessarily come during a match. You could do a run in to dish out a beating while a wrestler’s making their entrance. This make affect your move or move result choices. More classically, you can do a run in after a match—beating up the winner or the loser while they’re weak. You can even do that as they’re heading for the locker room. In this case, I’d call that Cutting a Promo or Working the Audience, depending on intent. It’s a great way to set up future feuds. Related, a losing wrestler might Cut a Promo after a loss because they’re angry about the result. They might jump the winner immediately. Or they have a posse that jumps in to do that. That’s a little like a run in. I keep mixing up a couple of term. Each playbooks is a Gimmick. But sometimes when I’m running, I refer to a character’s gimmick when I mean shtick or theme. For example The Undertakers’ a Monster Gimmick wrestler; his shtick is that he’s an evil sorcerer or something from the underworld. The PC Harbinger’s a Monster too, but his shtick that he’s some kind of force of nature covered in mud. You may not get that mixed up…I do. 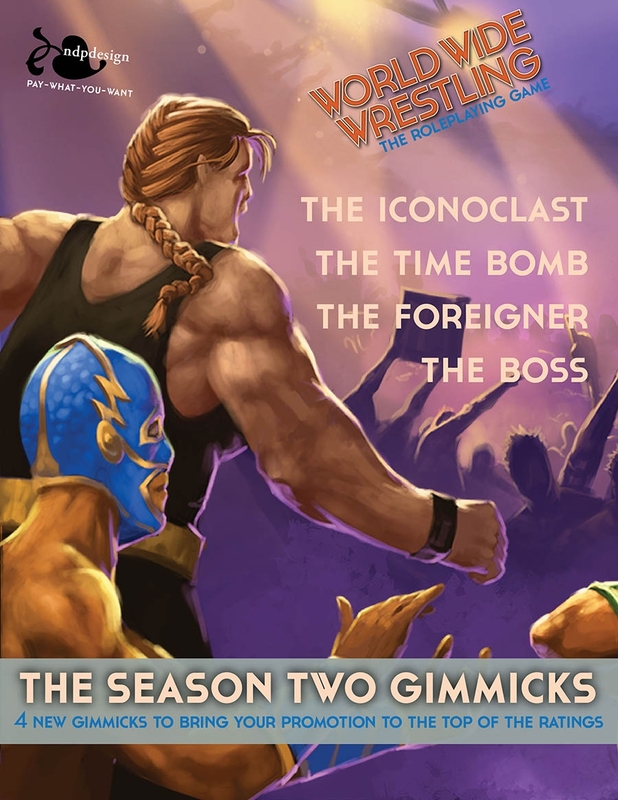 One of the GM soft moves is to add a Wrestler to a stable. That means a formal or informal group within a wrestling promotion. They’re great because they come with a set of NPWs and opportunities for inter and intra-stable rivalries. It looks like Japanese Wrestling uses these a lot. Those stables are hugely important and their leadership’s a matter of contention. You also see this in US pro wrestling with groups of “Bad Boys Taking Down the Promotion from the Inside” or “Theme Team Ups for a Cause.” Stables are cool and can add another layer of story to a match. 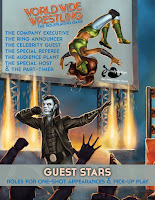 The four corners of the ring are the Turnbuckles. A nasty heel thing to do is to take the padding off and smash your opponent against it the bare metal. Wrestlers climb the turnbuckle to do big flying attacks. Big top rope flying moves are called Highspots. Climbing to the top rope’s a thing commentators call out “it’s so dangerous.” One of the classic moves is for someone to go up on the turnbuckle for a big move, only to have the other wrestler come up and grab them as they’re up there. Also, the edge of the mat’s called the apron. You’ve all heard of Cage Matches. I assumed they were just about keeping the two wrestlers together in the ring with no escape. It can be that. But more often it is about winning by being the first wrestler to escape. You can to get to a door, climb over the top, or cut a lock before your opponent(s). Sometimes cages will have extra bits: like multilevel cages you have to climb from one level to another. A Bump’s a fall or flat landing. Usually a hard fall. Originally I thought it meant any messed up hit. But that’s really a Botch. Over means someone’s popular. You “Put Someone Over” by making them look good. That can be negative if management’s doing that but the crowd doesn’t agree. To Bury someone is to make them look bad. Management might book a series of losses to bury a wrestler. You call a series of actions in a match a Spot. Finally, I was surprised when I saw wrestlers go out of the ring during a match. I assumed that was an automatic loss. In fact the area outside the ring’s a great stage for wrestling spots. In Lucha Libre, wrestlers often use the ropes to fling themselves out to knock down opponents. Wrestlers can argue with the fans, smash the announcer’s table, or take the fight into the stands when they’re out of the ring. One classic bit is wrestlers evading dangerous opponents by waiting outside for a while or wear them out though chases. “Smart” wrestlers with “Veteran Instincts” go outside the ring to catch their breath. For matches with multiple opponents, unengaged wrestlers can lurk outside waiting for a chance to interrupt and come back in to “surprise” everyone. There’s much more, but that’s what I remember having to learn when I started watching matches. I did so with a notebook in hand, making notes for future plays of World Wide Wrestling. The G+ WWW Community is awesome for answering questions. Also check out Wikipedia’s Glossary of Pro Wrestling Terms. It’s clear going through these lists designers have varied approaches to the idea of an rpg that can do everything. We’ve seen 89 rpgs, not counting pdf-only mentions. Today’s list, in particular, showcases a spectrum of “conceptions.” I have an analogy for this, a way of thinking about what’s happening in these different systems. And it comes from watching The Lego Batman Movie. On one end of the Universal RPG spectrum we have games with a high density of rules, some dare call it crunch. These game intend to model every element and make those elements feel correct within the mechanics. That means a large number of rules which aren’t necessarily symmetrical, but do fit together. I’ll peg GURPS as the current end point of this approach, with HERO close by. We’ll call these games “Lego Games.” They have lots of building blocks. Most of the pieces share a common logic: four stud brick, flat pieces, headlight brick. But we also have some weird pieces- windows, plates, minifigs. They’re clearly part of the mechanics; they socket up with the rest of the geometry. But they also introduce new elements and require new ways to arrange them. We can make anything with Legos- though to make them look good we may need a custom set released by the company. On the other end of the spectrum, we have “Play-Doh Games.” You can make anything with Play-Doh. It’s soft and malleable. It has no inherent shape, leaving everything open. More Play-Doh, less Play-Doh, it’s all the same. You know exactly how it all works right away. It doesn’t matter what color of clay it is, it smushes the same. These are usually story game rpgs. There’s a simple set of rules, but everything’s relative. All conflicts are equal; all elements work the same way, characters and objects use the same descriptors, equipment’s just part of the fiction, etc. It may even be diceless. Towards this end we’ll put Fate, Wordplay, Story Engine, and the like. It isn’t a great analogy, but it helps me think about what’s happening differently in these systems. Savage Worlds, True20, and many others fall somewhere in the middle. I don’t know if I have a toy to describe those. I do think there’s a way to describe PBtA within this schema. PbtA’s the collection of all of the various Lego successors and emulators all thrown together (Mega Blocks, Playmobil, Kre-O, Cobi, etc). Right? I only include core books here. I’m also only listing books with a physical edition. I might include an electronic release if they’re notable and of significant size. At the end you’ll see some miscellaneous entries, covering borderline or similar cases. Some selections came down to a judgement call. I’m sure I missed some releases. If you spot something Universal I missed which came out from 2010-2011, leave a note in the comments. A self-published Norwegian universal rpg. Appears to be a storyteller game where the role of the "scene owner" passes between players. 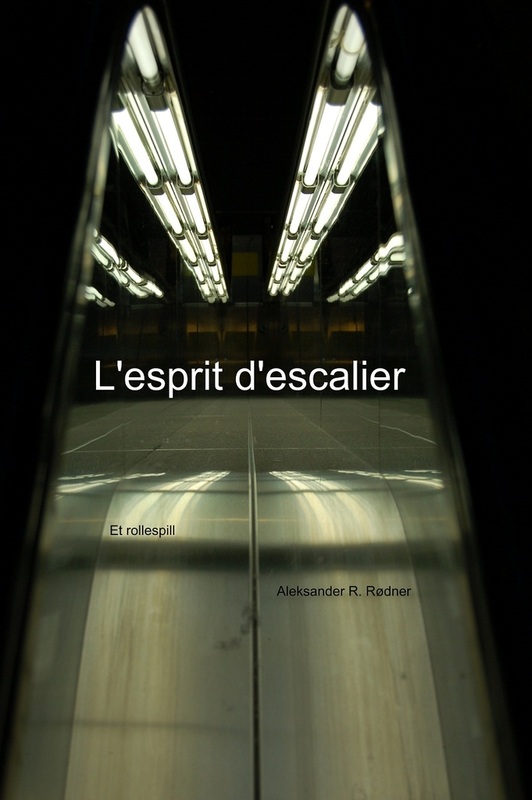 For the less literate (namely me) I looked up the title’s translation "L'esprit de l'escalier or l'esprit d'escalier ("staircase wit") is a French term used in English for the predicament of thinking of the perfect reply too late." Chronology poses a challenge when I assemble these lists. Some designers have a habit of calling something "X edition" based on several self-published or in-house iterations. That’s probably great for version control, but less useful for me when I hit a published third edition of something and can't find info on any earlier ones. 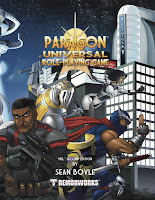 But I digress, I was talking about Gaia Saga Universal Roleplaying 2nd Edition. When I have trouble finding samples or reviews, I turn to blurbs, forum posts, and publisher statements. It looks like Gaia Saga came out of an earlier fantasy rpg developed by the author. A lot of that DNA may have carried over. I'm always wary when I see a universal rpg talk about "thirteen playable races to choose from." That suggests a more specific game world or setting, rather than a toolbox. The blurbs mention spells and magic as well, so I suspect this may actually be a universal fantasy game, with bits left open. In other words, universal but the GM has to build anything non-fantasy. I found the mention of a "personality and emotions engine" intriguing. In a forum post, the designer describes is this way, "Personality Engine: Keeps track of your characters moods, how they act generally, and helps decide your alignment by how you act. 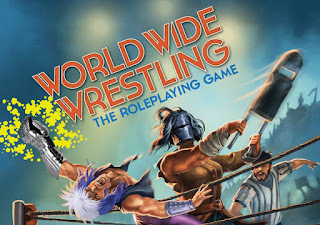 Gives players a focus so they can roleplay their characters in the best way possible. Emotions Chart: Shows a list of friends and enemies, their feelings towards your character, and gives a reference point on how to increase game play and realism." I wonder how mechanical that actually is. A streamlined game built on the Open d6 engine. This is WEG’s d6 System stripped down to basics. Character creation's covered in two pages and that includes a perk list. While that leaves a lot of heavy lifting to the GM, it’s less than you might suppose. You could run a pick-up session with what's on offer. Resolution's covered in just two pages and that includes two different approaches to combat: Fast Static Combat and Traditional Open d6 Combat. A sample magic system and sample characters get the longest page counts, each clocking in at four pages. The book includes several simple settings, each presented in two pages: Firefly-esque, trad fantasy, Victorian horror, '70's Beat Cop, and an homage to Traveller's Imperium. This is a solid, solid package and one worth looking at if you're hunting for a robust but light system. A game from John Arcadian, a contributor and co-author of many contributions to Gnome Stew releases. Silvervine's a point-buy system, dense with info and options. Players roll a pool of d10's with 8's as the default success number. Relevant skills reduce that target number. You compare total successes the task difficulty. It's clean and the rules read well. I particularly like the idea that your roll is based on a primary attribute plus another supporting attribute. The former shows the most important element needed, while the latter demonstrates nuance. Focuses- the special powers of the system- can modify the success, results, and fiction of these actions. While Silvervine has clear mechanics, it also spends a chunk of time talking about collaborative, thematic, and narrative elements of play. There's interesting discussion of where to hand off narration to the players. Despite that storygame talk, is has some crunch. Character creation’s fairly involved. It reminds me a little of Big Eyes, Small Mouth. Players have broad details which they can modify to create their unique abilities. To illustrate character creation, Silvervine uses its example Anime/ Steampunk/ Fantasy “Cyrus World: setting. That's good in that it offers concrete examples. However muddies the division between the generic cc rules and those for this world. That's a problem. Either this needed to be the rules just for that setting or needed to take a much more generic presentation approach. While it might not to be to my taste as generic ruleset, Silvervine provides and interesting and flexible approach to this hybrid world. Silvervine released under the CC 4.0 license and currently available as a PWYW pdf on Drivethru. 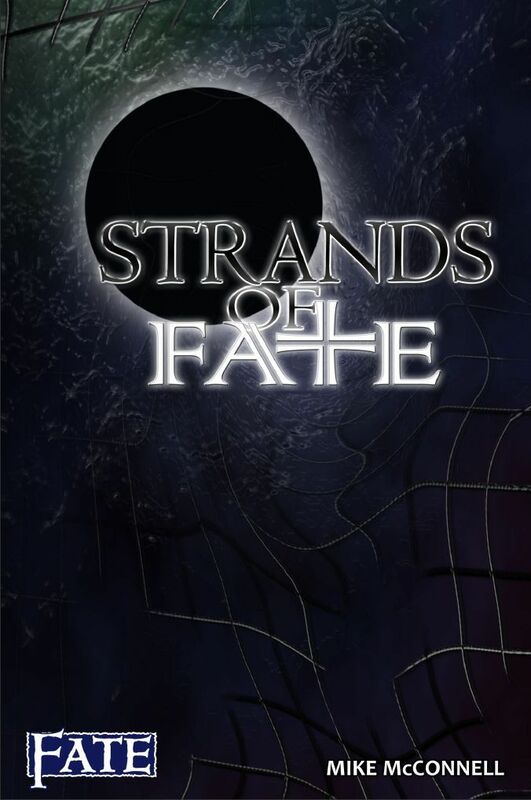 I picked up Strands of Fate on a friend's recommendation. Prior to that I'd only encountered Fate via Diaspora and Spirit of the Century. However made the base mechanics clear. I couldn't put together how the system actually played. Surprisingly it finally came together when I read Strands. Suprising because SoF takes such a different approach to Fate. It feels a lot like Fate 3.0 crossed with Champions or GURPS. There’s a focus on point buy and construction. It clearly wants granularity- the ability to assemble all kinds of powers, devices, and magic. It also has a different approach to skills and aspects. Strands of Fate didn't click for me, but it did give me a sense of how aspects worked in Fate. By going back to other Fate games and comparing them to Strands of Fate, I started to have a decent sense of Fate's base mechanics. That leaner approach appealed to me more than the engineered systems described in SoF. Despite that, Strands of Fate works. It offers a point-based structure, with lots of statting up and building. If that's what you like, but you still want relatively light resolution mechanics, you could do worse. Void Star released a large supplement the following year, Strands of Power. That offers many new advantages, powers, and mechanics for different genres. Picking that up if you dig the core book. A two-players rpg with random event generation. World vs. Hero echoes the Mythic GM Emulator from the same designer. It leans into an open approach, making it high up on the “relativism” scale and useful for any genre. WvH bills itself as a "strategic" storytelling game. The two players- Hero and GM- compete during play. The player can define The Hero broadly; it might be a single person, an adventuring company, or something in between. They build that character from narrative phrases as well as some numerical stats, called Suit Abilities. The game resolves using playing cards, so each abilities ties into a suit. Those in turn affect different kinds of conflicts. While the World player seems like the GM, they have limits on what they can throw at the Hero. The intent is mechanical balance. 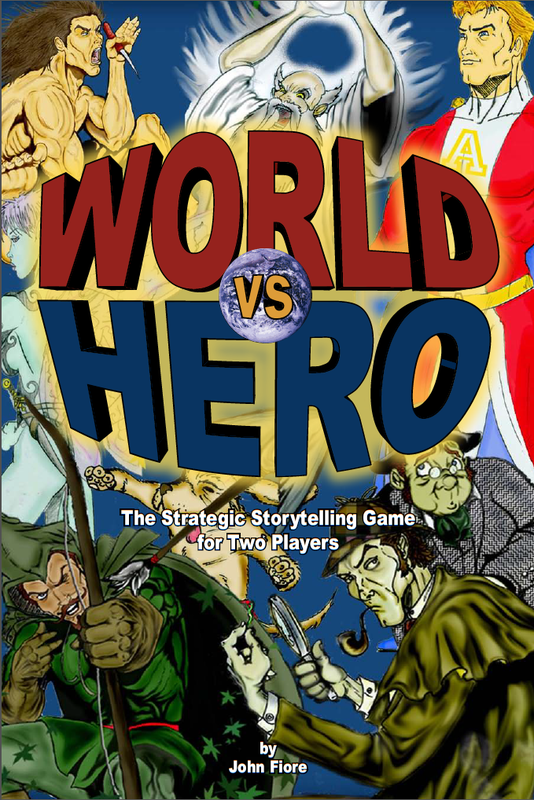 Cards are drawn, the Hero sets the location, the World puts a card forward for the conflict, the Hero uses another to activate appropriate abilities. Play continues this way. It’s an interesting idea and offers a cool option for freeform two-player story games. The game includes a optional rules for adapting this to existing settings, doing play by post, or using it more closely with the Mythic GME. Marcelo Paschoalin offers an important correction on this: "World vs. Hero was designed by John Fiore, while Mythic (and Mythic: GME) was designed by Tana Pigeon. You probably made the mistake due to the two games work really well together if one wants to play WvsH solo." Good catch-- people referencing the two together and the shared publisher made it easier for my mistake, but it's my fault. Not the same as BareBones Fantasy. But I could be forgiven for thinking that, given that the publisher, Scaldcrow Games, has erased Bare Bones Multiverse in favor of other products. 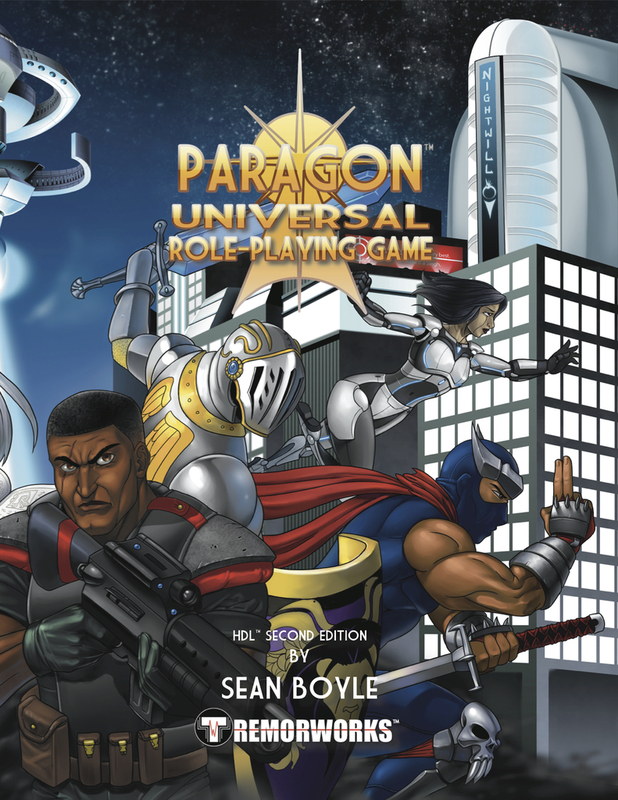 You can find archived review pages, but the main product's gone from DTRPG. Those reviewers have wildly mixed reactions; some like the 2d6 system, some loathe the presentation. Others find it middle of the road. The system itself takes up only the first twenty pages of the rulebook, with the rest given over to nine sample settings. Scaldcrow has reworked this into other, primarily pulp rpgs: Rotwang City, Davey Beauchamp's Amazing Pulp Adventures-Role Playing Game, and Bare Bones Beyond: Worlds of Pulp. This last one feels universal adjacent, intended to cover any genre with a pulp filter. You make checks in BEAN! by throwing a handful of beans. Maybe…if you want to go all in on the theme. You don’t have to. BEAN! uses a d2 randomizer, so you could use coins or even/odds on dice. Ubiquity functions much the same way, counting up successes for evens on d6’s. Of course using beans has a tactile benefit. More importantly it gives the BEAN! designers a hook for all their artwork- a showcase of anthropomorphic legumes. That simplicity and humor make it a good choice as a game for kids. BEAN! has default fantasy frame, but is written to be adapted broadly. It falls into what you might call tissue paper or, less judgmentally, streamlined universal rpgs. Simple standard resolution, a few choices for character creation, and just enough mechanics to feel like you have a safety net. Unlike many of these slight rpgs, BEAN! has been supported with several releases: a second edition, solo adventures, modules, and world sourcebooks. When I first came across this I wasn’t sure if it was a stand-alone game or a bolt on to something else. “obSESSION is more than just a Role Playing Game, it is a set of core mechanics designed for use with any setting, genre or game style…Additional optional rules from Obsessive Compulsive Design are fully compatible with the rules found within, expanding upon rather than contradicting the core rules and ensuring that any optional expansion is usable with any obSESSION game, not just one or two.” Not the deliberate choice to abbreviate the game to OCD. obSESSION might be crunchy. “Derived Attributes” is a key warning for me. We have ten-second rounds, a “Soaking” score that you compare damage to in order to determine actual wounds, saving throws with levels of effect, 26 hit locations, encumbrance, character levels, builds & templates, sixteen primary attributes and eight derived. Other Worlds came as a nice surprise. It looked very trad at first glance. Instead you get a system built on player-defined abilities and flexible narratives. It opens with discussions of story and "shared creativity." 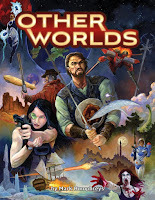 Other Worlds signals its intent to share power and "give everyone the power to drive events forward and introduce new elements to the plot." Characters consist of Abilities with associated ratings. Players define these, breaking them into General Abilities, Personality Traits, and Relationships. Those slot into one of several templates: cultural archetypes, professional archetypes, individuality, and trademarks. Example abilities include, "Speak Japanese, Curious, Loves Roberto, Chase Suspect, and I Ain’t Getting in No Plane." To build your character you choose four templates, each with a set of abilities. Then you create your “individuality” by choosing up to 24 additional abilities. These all have a default ratings which you can modify. The resulting character record looks dense. I'm used to lighter systems having easy-to-grok sheets. That's what we get from games like PDQ and Fate. Here you have lots and lots of things to sort through once your character's put together. It looks like a GUMSHOE sheet. This may work for some gamers. I'm less a fan of having to hunt through my many, many lists to figure out what I need to roll. And you'll likely be doing that hunting quite a bit. When a conflict occurs you figure out your rating by assembling a total based on a primary ability's rating, modified by bonuses from any supporting abilities. That means scanning through to get the maximum effect from the ability sets you've crafted. Some players will get fast at this, others will suffer from analysis paralysis. The opposition also creates a total, meaning the GM’s doing a parallel hunt. Both roll a d100 and it to their final rating. Higher roll wins and chooses the outcome. The base system is simplicity itself, but the steps require some crunching. I'd have to see it in play. I do like the way Other Worlds frames conflicts as universal and then slots that into a larger structure of "set pieces." There's some neat tech here. 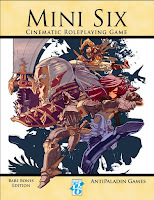 It's well written and has echoes of HeroQuest, Fate, and PDQ. But it feels more elaborate than any of those. The cover has a photo of a d10 with added flame effects burning a streak through a side-of-a-van-worthy fantasy collage painting. Every page uses a variant of that image as a one-inch, full-color page frame. The pages alternate space-ships & moons at the top, dungeon doors & tunnels at the bottom. Throughout it all the still-burning d10 appears as the page number the backdrop. The actual tight, double-column text sits on a greyed-out frame, a palimpsest below. You can just make out the image lying beneath the text. Occasional odd stock-art choices break this up, but you're more likely to be interrupted by a table or chart. OK. I have to take a break. It feels like a strange mix of 1980's design combined with first-gen indie 1990's DTP efforts. The character sheet...sorry, I'm not even going to try to describe it. Here's the thing-- I'm sure the designer got a lot of great gaming out of this system. He lists 34 guys (and one woman) as playtesters. This probably clicked for the level of crunch they wanted. But wow: this is hard to read and parse. It's so far outside my comfort zone-- and I was still playing Rolemaster up to the beginning of the year. This offers another one of those moment when I must simply turn to the author's blurb: "Everyone has, in one point of time or another, played a Role-Playing Game. This is Story Teller's Version 1.5 of The Story, a 3D6 gaming system, closely related to D&D and GURPS." So that’s helpful. These two years saw major revisions to existing universal rpgs. Savage Worlds Deluxe is another tinkering with this venerable system. According to the publisher it, "includes rules updates, new rules material, new art, more examples, an expanded Setting Rules section, Designer Notes to give you an insight into the development, and much more. It does not, however, invalidate prior printings of the rules, which you can continue enjoy." This appears to be the most current edition as of this writing. After a decade Story Engine Plus revises and cleans up the original Story Engine. This edition received two Indie Game Design "Runner Up" awards. The main stated difference seems to be a refinement of the adjective-based character creation. 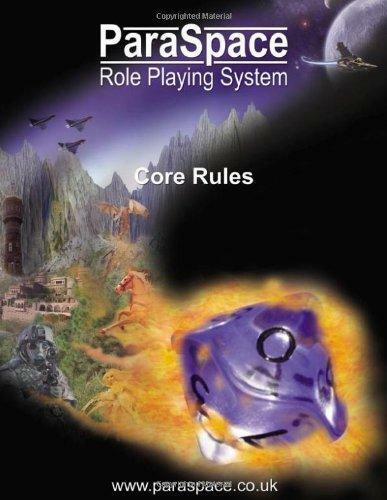 MADS Role Playing Game (Revised) expands this system with a 40% larger page count. Finally Paragon HDL is the new name of the Paragon Tactical RPG. This updated version also now powers their Demongate High, Perfect Horizon 216X, and LUCID: Dreamscape Reality games. Several games come close to being "Universal" but have a more subtle thematic approach. Skullduggery takes the oppositional mechanics from The Dying Earth rpg for a game of negotiated backstabbling. It can cover many genres and the book includes several different set ups, including the selection of a Pope (timely now given HBO's The Young Pope series). It’s like a complicated Fiasco. Microscope's a game I’ve talked about and played extensively. It offers an rpg about any history, though some debate the rpg nature of it. Microscope can cover any genres, but players move from character to character in scenes across times. Finally Idee! Das Universalrollenspiel: Edition Ad Astra is a German card-based systems for telling rpg-like stories. This period saw some striking and larger pdf-only releases. d6 Intégral is a French take on the d6 Open system. They supported it with several Lulu-only supplements. 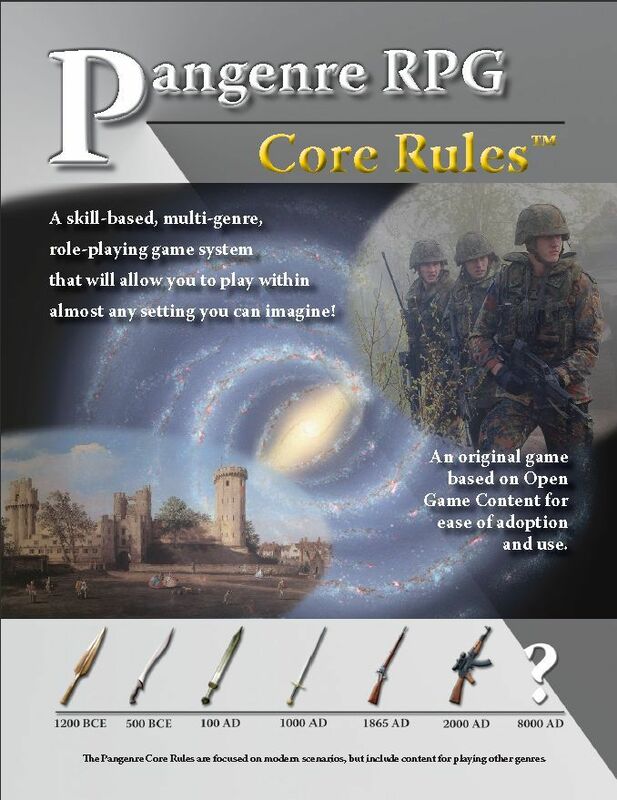 Pangenre RPG Core offers an adapted d20 system for universal gaming. It has several different “final” and “beta” versions, plus some topic-specific supplements. Sundered Epoch is another game with many different versions and "editions" out there. It seems to be a d6 stat plus skill system. RPGGeek lists a couple dozen supplements of various lengths for this. Finally Polyverse appears to a more detail heavy universal system. It has a supers supplement available.